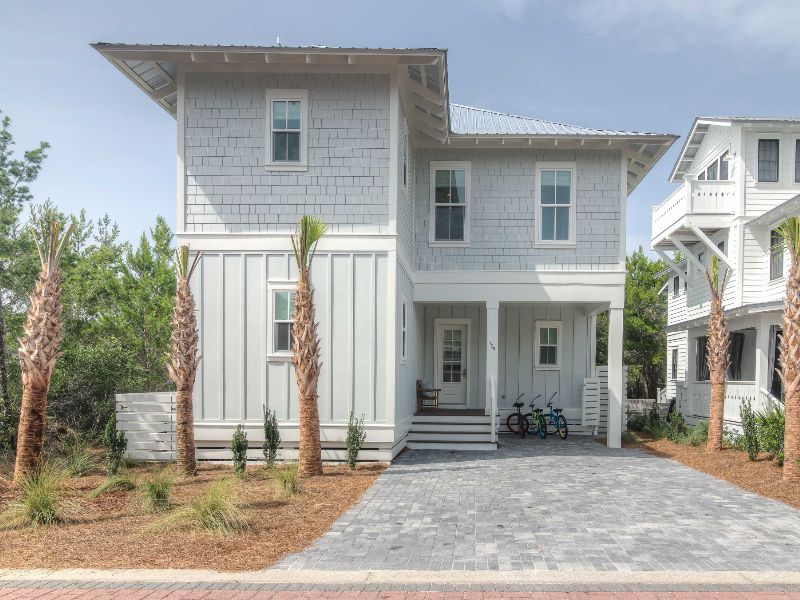 129 Flip Flop is a newly constructed 4 bedroom home with upscale coastal decor throughout. It’s located in popular Seacrest, snuggled in between Alys and Rosemary Beach. Surrounded by endless dining, shopping and entertainment, your family can always find something to do. Opt for walking 10 minutes to the beach or hop on the complimentary shuttle service (runs seasonally). You will pass the centrally located lagoon pool, the highlight of many visitors stay. Upon entering the home you will find yourself in the open concept living area with floor to ceiling white shiplap walls and beautiful wood flooring. The kitchen offers top of the line stainless steel appliances, a large center island with a farmhouse sink, and beautiful countertops. There is bar seating for four off the island and seating for six around the dining table. Out back is a screened in porch, outdoor dining, and built-in gas grill. The first floor is also home to a guest bedroom with a king bed and private bathroom with double sinks and a large walk-in shower. Head up the stairs to find the rest of the bedrooms. The spacious master bedroom has a king bed and large private master bathroom. The bathroom has a large vanity with double sinks, a soaking tub, large walk-in shower. The second guest bedroom also has a king bed with private full bath complete with double sinks and a white subway tile walk-in shower. The final bedroom has one set of built-in full bunk beds and one set of twin built-in bunk beds. The bunk room has its own private bath with double sinks and a gray subway tile walk-in shower. After long days at the beach you can come home to your own upscale beach home and make dinners in the beautiful kitchen or cozy up on the couches to watch a movie. 129 Flip Flop is the perfect home for your next beach vacation!